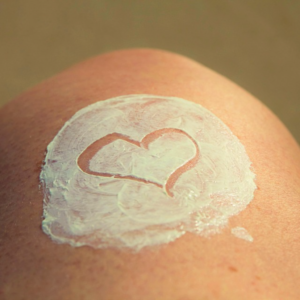 Hydrocortisone cream is one of the most effective treatments for relieving the itching and discomfort associated with eczema, but you may have heard that you shouldn’t use it! Find out why the exact opposite is true and how to get the most out of this controversial treatment. Thinning Skin and Hydrocortisone Cream? The inflammation of eczema breakouts, and your reaction to them (scratching), reduces skin’s ability to heal, can cause collagen and elastin to break down, which makes the skin more vulnerable to environmental damage—even a risk of infection. None of this is desirable, and it’s detrimental to the health of skin, over both the short term and long term. For many people, cortisone cream is nothing less than a miracle; Paula, the founder of Paula’s Choice Skincare, can personally attest to that, as she’s struggled with eczema to one degree or another for most of her life. Anecdotally, except for the areas where she used it chronically day in and day out for years there have been no negative consequences and the skin in those areas looks completely normal and healthy. Using cortisone creams indefinitely, or otherwise irresponsibly, is the problem where side effects are concerned, not intermittent use to stop the symptoms and reactions so skin can begin to heal. In those situations, it’s not uncommon for the doctor to prescribe two or more preparations of different strengths to be used at the same time, but on different parts of the body. For example, a mild cortisone cream for eczema on your face and a moderately strong version for eczema on the thicker skin of your arms or legs. A very strong topical cream is often needed for eczema on the palms and soles of the feet of adults. These areas have thick skin, and eczema doesn’t respond as well to low-strength cortisone creams. Remember: Cortisone creams are only as effective as your overall management plan for your eczema—it’s critical that you are avoiding fragranced products, using mild cleansers and well-formulated moisturizers loaded with reparative agents. [2,3,4]Do not make the mistake of relying only on cortisone treatments and ignoring the pivotal role that a good skincare routine can have on reducing the frequency and severity of eczema flare-ups. Topical cortisone creams should be used until the flare-up is completely gone—or for two weeks, whichever is first—and then you should stop the treatment and only use it again when another flare-up occurs. It’s best to use the smallest amount possible that reduces the inflammation and itching; applying more won’t make it work any faster or any better. In some cases, it might require treatment for as little as one day; in other cases, it may take up to 14 days to clear a flare-up. If it takes longer, you’ll want to consult your physician. Keep in mind that the sooner you apply cortisone cream when you notice a flare-up starting—before it gets bad—reduces the amount of time you’ll need to continue the treatment. When you weigh the pros and cons of cortisone creams, the research and results are clear: The damage that results from letting inflamed, raw skin linger can be far worse than the effects of intermittent use of a cortisone cream, whether OTC or prescription-only. Don’t let inaccurate information prevent you from taking the best possible care of your skin. Hong E, Smith S, Fischer G. Evaluation of the atrophogenic potential of topical corticosteroids in pediatric dermatology patients. Pediatr Dermatol. 2011;28(4):393-6. Hanifin JM, Cooper KD, Ho VC, et al. Guidelines of care for atopic dermatitis, developed in accordance with the American Academy of Dermatology (AAD)/American Academy of Dermatology Association “Administrative Regulations for Evidence-Based CLINICAL Practice Guidelines.” J Am Acad Dermatol. 2004 Mar;50(3):391-404. Walling HW, Swick BL. Update on the management of chronic eczema: new approaches and emerging treatment options. Clin Cosmet Investig Dermatol. 2010; 3: 99–117. Charman C, Morris A, Williams H. Topical corticosteroid phobia in patients with atopic eczema. Br J Dermatol. 2000;142(5):931-6.